re:publica Accra, the very first re:publica conference held in Africa, took place on 14-15th December 2018 at the Trade Centre in Accra, Ghana and was attended by over 2000 people from 32 countries. GIG was a supporter for this African edition of re:publica. Many GIGers were among the curation & organizing team as well as speakers. GIG also hosted the makerspace through Kumasi Hive. Kudzai M Mubaiwa (iZone Hub, Zimbabwe), Nanjira Sambuli (World Wide Web Foundation, Kenya) and Jorge Appiah (Kumasi Hive, Ghana) curated the tracks around the topics ‘Business and Innovation’, Politics and Society’ and ‘Science and Education’. Nanjira Sambuli gave the first keynote speech right after the opening ceremony. It was a candid talk urging Africans to face up to the fact that we cannot innovate ourselves out of bad governance and historical injustices, and encouraging Western partners to change their mindsets about Africa for more fruitful collaboration’. Too many interesting panels on at the same time at #rpaccra. Currently at https://t.co/LwoO9YlYAZ with @AcetforAfrica‘s Freda Yawson, @annawillcreate of @KumasiHive and Yaw Adu-Gyamfi of OpenAIR. There are others on afro futurism, IoP(lants), accessible geodata, etc going on. 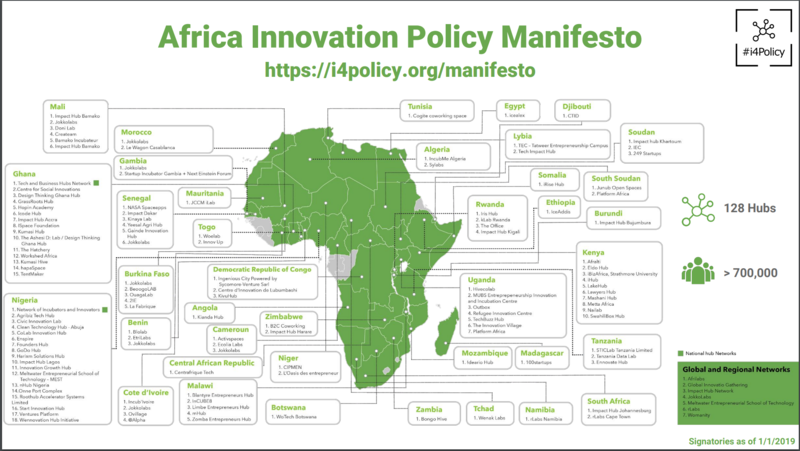 #i4policy is an ongoing effort by social innovators, entrepreneurs, innovation spaces and startups across Africa that have come together to articulate views and recommendations for policies that they believe will accelerate digital transformation and contribute to more equitable, inclusive and sustainable development of our economies and societies and more importantly to strategically engage with policymakers to further this agenda. The President of Senegal was receptive to the draft of the Startup Act and promised to implement it by January 2019 ~@evasowebion #rpaccra #i4policy @rpaccra @wearegig #boom! And in the first week of January 2019, Eva, Mariam and Jon went to Washington DC with cabinet ministers from Mali and Senegal to present the Policy Hackathon methodology developed by #i4policy members. Here’s a link to their presentation. Georgia Nicolau(Brazil), Asmaa Guedira (Morocco) and Bianca Ama Manu (Ghana) had a candid session called “The power of Unlearning in Reimagining the Future”. During this session, they unpacked the effect of colonialism on mindsets and that acknowledging these and actively unlearning them could free up our minds for more authentic innovation. Gilberto Vieira, Asmaa Guedira, Brenda Wambui and Georgia Nicolau then had a session on citizen journalism and how it’s being applied in addressing crucial societal issues in their countries, Brazil, Morocco and Kenya. Still on citizen journalism, Tim Human (winner of Mozilla Equal Rating Innovation Challenge) explored “Connectivity through Content – Citizen Journalism and Public WiFi” where he argued that to bridge the gap that technology creates, it’s not just telecoms infrastructure that needs to be installed, but affordable connectivity and relevant content to engage with in order to ensure that individuals can advance their digital literacy. Sénamé Koffi Agbodjinou (Woe Lab, Togo) held a keynote and was part of a panel on Future Cities, asession that examined how digital technologies can improve urban lives and make urban development fairer and more participatory, from address systems to architecture to access to resources in urban contexts. Johanna Havemann (Access to Perspectives, Germany) was part of a panel discussing “The Importance of Local Languages and Informal Sciences for Africa” where she and her co-panelists explored how Open Science can contribute to an open society with initiatives and organisations like Wikimedia, preprint repositories, collaborative platforms promoting economic development. Nanjira Sambuli (World Wide Web Foundation, Kenya), interviewed Kudzai M Mubaiwa ( iZone Hub, Zimbabwe) and Boniface Mwangi (PAWA 254, Kenya), both candidates for Member of Parliament in the immediately concluded elections in their respective countries, as part of the session “House of Hashtags: Insights from Future MPs”. We learnt about both candidate’s personal journey and motivation and how they have been trying to hack the political system in Kenya and Zimbabwe, through art, public protest and hashtags. The session highlighted the major issues with democracy in Africa. Kudzai focused on the post Mugabe Zimbabwe era and the role of the internet in recent elections, in particular on digital impacted voter registration, education, and engagement. Boniface shared his use of art and digital media in driving social movements in Kenya as well as his experience with online and offline power games and hate speech. Kudzai also entered a discussion on “Startup Economy – Future or Fairytale?” where they discussed the growing popularity of startup culture and asked pertinent questions likeAre we selling the next generation the right dream? Will the startup economy continue to bloom? Will startups and entrepreneurs help African countries break free from aid dependency? Mark Kamau (BRCK, Kenya) was part of a panel in the session “Free Internet for All. Creating Alternatives to Zero Rating”. The panel not only debated the effects of zero rating (the practice of providing Internet access without financial cost under certain conditions) and why alternatives are necessary to bridge the data divide, but during the discussion showcased different solutions for public access provision will be showcased. As is tradition at re:publica, GIG had a makerspace at #rpAccra. This one was in partnership with Kumasi Hive, Impact Hub Accra and Woelab, hosting a number of hands-on workshops, meet-ups and an e-waste installation. Among them “Two Cities, One Prototype: Co-Creating from Accra to Kumasi”, an ongoing workshop shedding light on the misconception of center and periphery by collaborating across the country that took place throughout the two days of re:publica and was hosted by Jorge Appiah and his team from Kumasi Hive. Nicolas Pace from Alter Mundi gave workshops on community networks at the makerspace all day on both days. Another event at the makerspace was the Africa Open Science and Hardware (AfricaOSH) team announcing Africa Open Science & Hardware Summit 2019 to be held in Dar es Salaam Tanzania. You can apply here! Careables, a GIG project that is bringing together makers in the healthcare sector with anopen-source approach on medical hardware technological innovations hosted a meetup at #rpAccra. Tarek Omar, Maged Safwat and Ali Hussein of Cairo Hackerspace, Egypt gave a workshop on “The Internet of Plants”. Ali additionally hosted a session where he showed participants how to Create a Chatbot that Captures Your Personality”. Michael Asante-Afrifa of Science Set, Ghana, demonstrated how with the Science Set, complex concepts are broken down into simple, fun and engaging experiments for students. Eva Yayi Mawa Upele and Adam Abdulmalik from South Sudan presented “ASKotec – the mobile makerspace in a box”. They have a crowdfunding campaign to support skills development among refugees that you can donate to here. Apart from the candid, illuminating and thought provoking discussions, #rpAccra was a delicious mesh of beautiful and thought provoking art. Ten minutes put in all the loops myself but had to sub marimba with xylophone.